It was on this day, on the beaches of Normandy that the event occurred that foreshadowed the end of Hitler's reign of terror and eventually WW ll. Operation Overlord, the Allies code name for the invasion of France. It began on the storm torn beaches of Normandy and ended at the Arch de Triumph with the liberation of Paris. It didn't come easy or cheap but then freedom seldom is either easy or cheap. The year 2015 is the 70th anniversary of the end of World War II. 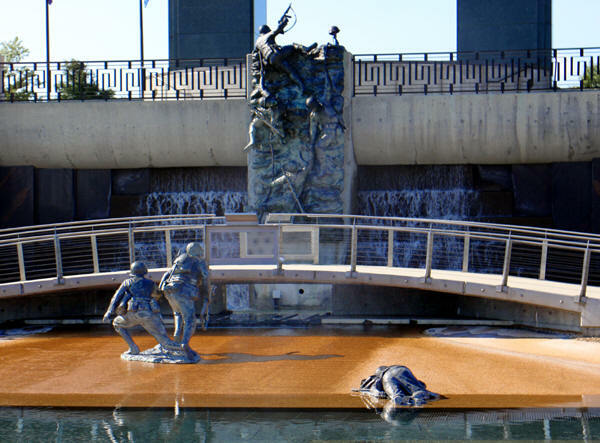 In commemoration I am giving you a glimpse of three memorials dedicated to this devastating war. Each one of these places is unique and well worth a visit in memory of the over 400 thousand Americans, 12 million other nations' allied forces and over three million holocaust victims who died in the most devastating war of all times. 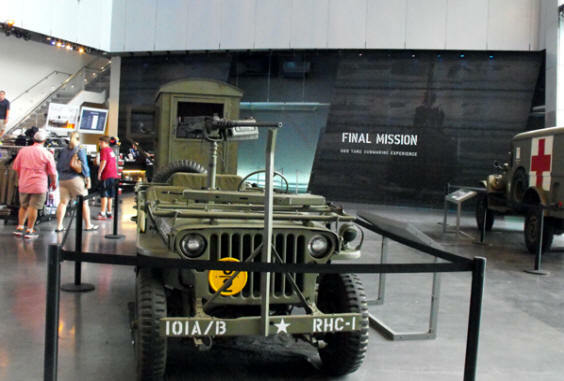 National World War II in New Orleans ranks number four among museums in the United States and number 11 in the world according to Trip Advisor. That's saying a lot. On a recent visit to the World War II Museum I could see how it achieved its rank. The museum is huge. The exhibits are real and extensive. And it's still growing. For anyone studying the history of World War II, this place is filled with tons of material, news paper articles from that time, letters from individuals affected by the war, documents related to strategy and actual recordings of soldiers and civilians about their experiences. 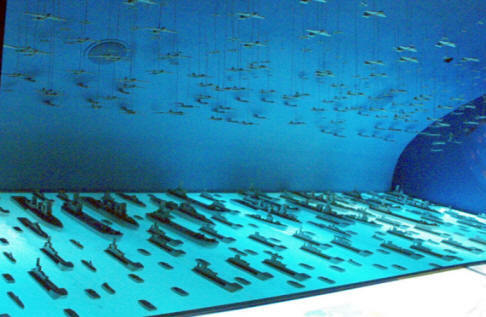 This museum transports you back to the war years. Your trip starts with a train trip from your home town to the training camp. You hear tapes of real young men and women explaining their reasons for enlisting. You will often find WWII veterans volunteering at the museum to tell their own stories. Throughout there are many tapes and letters from real people including General Eisenhower's letter taking full responsibility for D Day which could so easily have failed. The personal artifacts are fantastic but two exhibits really captured my interest. Both reflect on a little known portion of the war that were pivotal aspects. The first was the Enigma Machine. This was a early precursor to a computer. 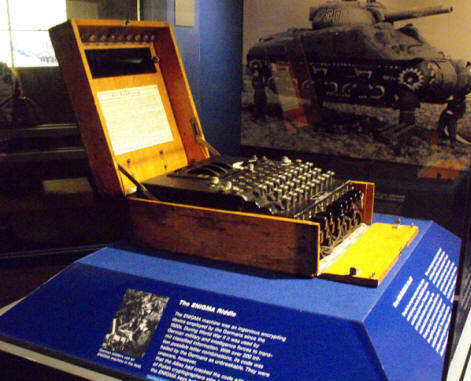 The Germans developed Enigma after WW1. It was a complex (for its time) machine that encrypted information. The Germans believed it uncrackable but the Poles were able to develop machinery to decipher the code in December 1932. By 1939, the Germans had improved Enigma to the degree that the Poles were unable to continue deciphering and brought in British and French Intelligence personnel and the newer codes were deciphered. Had the Allies not been able to crack these codes, the war could have gone differently. Another of those lesser known exhibits I found interesting was the contribution of a canny Irishman with a shipyard located in New Orleans Andrew Jackson Higgins. Hitler called him "The new Noah." General Dwight Eisenhower stated, "Andrew Higgins ... is the man who won the war for us. ... If Higgins had not designed and built those LCVPs, we never could have landed over an open beach. The whole strategy of the war would have been different." Higgins had designed a boat called the Eureka boat, a shallow-draft craft used by oil well drillers and fur trappers in the coastal waters of the gulf and Mississippi River area. These boats could run aground and then back off with no problem. they were fast and could turn almost within their own length. The Navy and Marine Corp. became interested in the Eureka when it appeared their own shipyards could not provide them with a successful landing craft to deploy men and equipment on to fortified beaches. The only drawback to the Eureka was that men had to disembark over the sides. Higgins developed a better version with a bow ramp which allowed the men to exit through the front. This new version became the LCVP (Landing Craft, Vehicle, Personnel), or simply, the "Higgins Boat." The museum has a detailed exhibit about the D Day invasion. It shows all the ships, aircraft and beach with each section and who would land where. After you visit the museum itself be sure to walk to the rear of the lot and view the many types of transport from tanks to planes used in the war. This is also where the Tom Hanks movie, Beyond All Boundaries, is shown. I didn't get to see it because of time constraints but I have heard it is excellent. Take a moment to view the little Victory Garden between the main museum and the back section. Victory Gardens were an important way the people on the home front could contribute to the war effort. There is so much more at this museum but I want to tell you about some other places memorializing WW II so I'll move on. 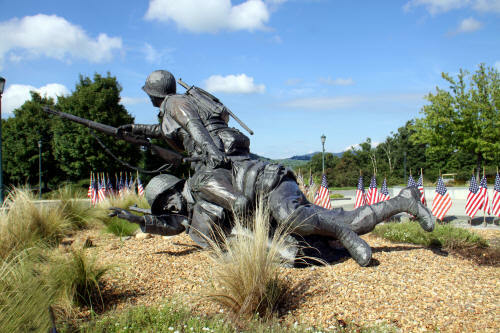 National D-Day Memorial in Bedford, Virginia is an outdoor sculpture garden filled with the most poignant figures you can imagine. According to Trip Adviser, it is the number one attraction in Virginia. When I visited, I expected a few statures set in a nice park. Instead I found an 88 acre park with a backdrop of the Peaks of Otter (see more about Peaks of Otter here) and filled with sculptures in a garden setting that memorialized one of the most important days in 20th century history, D Day. In military terminology, D Day merely means the day on which a combat attack or operation is to be initiated when the actual day when the actual date has not been set or where secrecy is important. 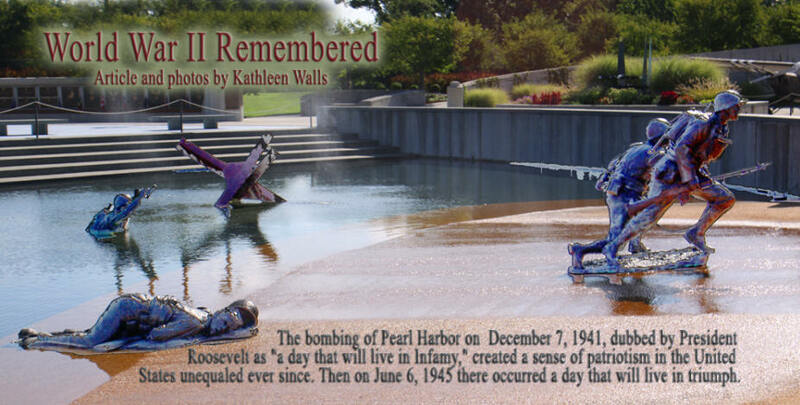 Felicia Lowrance, Education Coordinator for the National D-Day Memorial. explained how the memorial chronicles the entire spectrum of D Day. She told us to watch for one of three symbols that we would see repeated throughout the park; a lion, a dog and a pelican representing valor, fidelity and sacrifice. From the moment you step into the garden, the forty four foot six inch( representing June of 1944) black and white arch with OVERLORD emblazoned on it is the centerpiece that tends to frame all the other sculptures. The pond representing the beach at Normandy where larger than life bronze sculptures wade thorough the water with sprays of water bursting around them representing the non-ending hail of bullets the soldiers faced as they stormed Normandy's beaches. On the edge of the beach, lies a soldier who did not survive the barrage of bullets and on the beach two soldiers, one carrying a rifle and looking straight ahead, the other unarmed, a medic, turned sidewise as if considering ministering to a fallen comrade. On the wall leading to the top soldiers scale the wall. No feeling human could look upon this tableau and not be moved. The larger than life stature of General Dwight Eisenhower was taken from a famous picture of him addressing the troops. He seems to be instructing 101st Airborne in a last minute address or last bit of information before they go . In reality, Felicia told us they learned from a visiting veteran paratrooper who told them "He asked us what sports we liked. Someone said fly fishing and he started talking to us about fly fishing." Another sculpture that is particularly moving is a copy of Le Monument aux Morts. the original sculpture stands outside the Church of St. Aignan at Trevières, France. It is a Nike wearing the tradition drape but also a utility belt and helmet of a French soldier of WW1 . During the fighting after D Day, some shrapnel struck the figure and blew away a portion of its face below the upper lip along with most of its throat. This is the stature that is presented both at the National D Day Memorial and in its original position in France. It is a poignant reminder of the devastations of war. Of course this just scratches the surface of what you will find at the D Day Memorial. 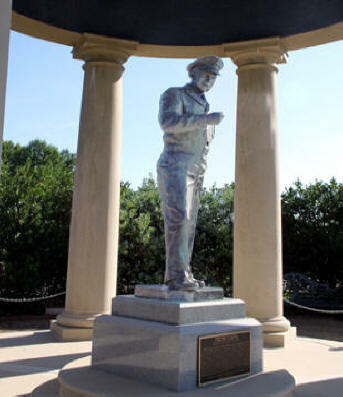 There is a reason why the memorial is located in the small town of Bedford. Bedford had the highest per capita loss of any city in the United States. They lost 19 men from Company A from Bedford within the first thirty minutes of the attack. This from a community of 3200 people. The Memorial opened on June 6 3001 with 24,000 people in attendance. President Bush's dedication of the Memorial said in part, "The achievement of Operation Overlord is nearly impossible to overstate, in its consequences for our own lives and the life of the world. Free societies in Europe can be traced to the first footprints on the first beach on June 6, 1944. What was lost on D-Day we can never measure and never forget." This memorial will always keep that memory fresh. Children's Holocaust Memorial in Whitwell, Tennessee is unique not because of the size of the museum. It is small and has less artifacts than many other museums. What makes it stand out is the way it came to be. We spoke with Ms. Linda Hooper who was Whitwell Middle School principal in 1998. She had asked Assistant Principal David Smith and Sandra Roberts to head a project to teach tolerance because as she explained, "This valley is 99% Protestant, white Anglo-Saxon. There is one Catholic mission and no Jewish families. So that summer there was a conference to find something to study to make children realize that there are lots of other people out there and they are all important and that we need to work to make things better." This led to a voluntary afterschool Holocaust education program. 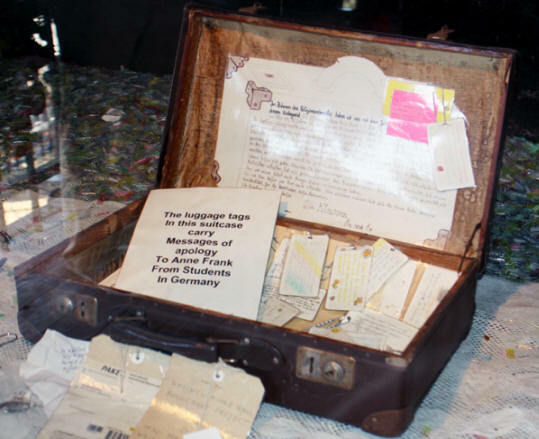 When the children had problems visualizing the 6,000,000 Jews who died in the Holocaust, they asked if they could use some material object as a visual aid. Ms. Hooper said, "It has to relate to the Holocaust or WW II." After some research, the students came up with the idea of paperclips. You might wonder how that would be relevant. The paperclip was originally invented by a Norwegian Jew. During World War II the Norwegians wore paper clips on their lapels as a protest of the Nazi occupation. So they sent out appeals to send paper clips with the idea of getting 6,000,000. They stopped counting at 30,000,000 paper clips. Many are packed in the railcar, 11,000,000 are in the children 's monument, some have been sent to a Baptist school in NJ trying to start a similar project. 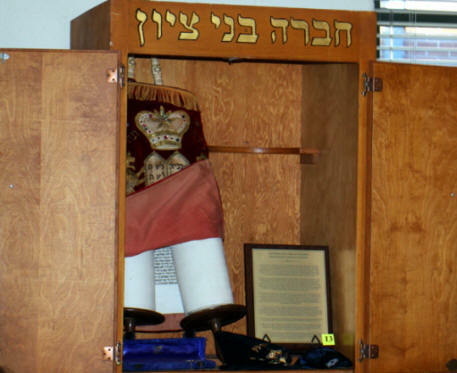 The rest packed in sheitel boxes, originally used to hold wigs or half-wigs used by married, Jewish women to cover their hair, for the little towns in Poland that were obliterated by the Nazis and put a paperclip for each person murdered in that town and send them out to the schools all over. The paper clips are still coming in. For a memorial with such a humble beginning, it has some amazing artifacts. For one, it has the largest collection of Holocaust literature donated to the memorial by Dr. Benjamin Nachman. Ms Hooper is particularly proud of their beautiful hand-written Torah. She told of its route into the Memorial, "Our Torah was written in Pusalotas, Lithuania. traveled to Johannesburg, South Africa then to Toronto, Canada where it was driven here by the family who had originally had commissioned it. It's over 100 years old and everything is original except the fringe at the top." Ms. Hooper explained about another amazing article in the memorial, Martin Small's tree, " It has 86 paper clips representing the 86 members of his family and his wife's family who were murdered during the Holocaust. He made it for his wife on their 50th anniversary when he was in his 80s." Martin himself is a Holocaust survivor. When the camp was liberated in the spring of 1945 by American forces, Martin had been left for dead in the barracks of the concentration camp in Gusen. Although he was just a young man in his twenties. he looked like an ancient skeleton and weighed only 75 pounds. A American soldier found him and loaded him into an Army ambulance which took him along with other survivors to a hospital in Linz. But the room inside the school is only part of the project. Out front of the school is a railcar surrounded by 18 butterfly sculptures and a monument to the children of the Holocaust. 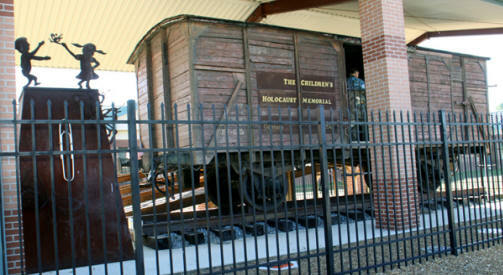 The rail car is a authentic transport car used to deliver Jews to the labor and death camps. I spoke to an eleventh grade student, a young man named Dalton Slatton . He had been working with the project for four years. I asked how it has affected his life. He replied, "I plan to major in Pharmaceuticals and minor in Political Science. I want to be in a position where if something like the Holocaust started again I would be in a position to stop it." This memorial shows the power of one idea. I hope this article will inspire each one of you who reads it to go visit these worthwhile places that recount a poignant part of our collective history. They represent the best of all those that gave some and some who gave all that freedom might live on forever.